EVERYONE knows that the vast majority of jazz musicians have been black rather than white. Therefore it has seemed natural to conclude that jazz "is black: there have been no white innovators, few white soloists of real distinction; the best white musicians (with an exception or two) were only dilute copies of black originals, and in any case exerted lasting influence only on other white musicians." These words are taken from Richard M. Sudhalter's brilliant and comprehensive new book, Lost Chords: White Musicians and Their Contributions to Jazz, 1915-1945 (Oxford University Press, 912 pages, $35.00). In these politically correct times any explicit recognition of white achievement in certain areas of endeavor, of which jazz is one, is in danger of being taken as a backhanded attempt to denigrate black achievement. Nothing could be further from Sudhalter's intent. [This book] is anything but an exercise in one-upsmanship or retaliation: any attempt to look at the music without regard to such seminal figures as Armstrong, Ellington, Coleman Hawkins, Lester Young, Henry Allen, Sid Catlett, Benny Carter, and the rest would be folly. Their primacy, and the reverence in which they are held, belong to the unquestioned foundation on which the whole edifice rests. Yet history is better than myths, Sudhalter insists, and history clearly tells us that "a distinct, significant, and creative white presence has existed in jazz from its first days," and that black contemporaries were "unhesitating in expressing respect for Bix Beiderbecke, Adrian Rollini, Jack Teagarden, Miff Mole, Frank Trumbauer, Steve Brown, Dave Tough, Bud Freeman, Pee Wee Russell, and numerous other white musicians." The true history of jazz, as Sudhalter sees it, is a "picaresque tale of cooperation, mutual admiration, cross-fertilization; comings-together and driftings-apart -- all despite, rather than because of, the segregation of the larger society." Recent scholarship has taught us that the term "jazz" was not known in New Orleans but was merely the name that northerners and Californians gave to the music that in New Orleans was called ragtime. Three ragtime bands, the first black and the other two white, arrived in Chicago in 1915-1916: the Creole Band, Tom Brown's band, and what would soon become the Original Dixieland Jazz Band. By January of 1917 the ODJB had moved on to New York for its historic engagement at Reisenweber's Restaurant; on January 30 it made its even more historic first record. As Sudhalter points out, the ODJB seized the opportunity when others faltered: Brown had turned down the Reisenweber's job, and the Creole Band's cornetist, Freddie Keppard, had vetoed a recording contract -- supposedly because he feared that the band's music would be stolen by other bands. Though the ODJB records contained a certain amount of hokum, they strongly influenced both black and white bands. The next great event was the arrival in Chicago, in 1921, of the white band that came to be known as the New Orleans Rhythm Kings. Led by the cornetist Paul Mares, a disciple of King Oliver, the band had on clarinet Leon Roppolo, whom Sudhalter calls the first great jazz soloist to record. The trombonist was George Brunis, a mainstay of Dixieland ensembles in New York and Chicago from the mid-1930s through the 1950s, and the bassist was Steve Brown, who had played in his brother Tom's band and would later join Beiderbecke in the orchestras of Jean Goldkette and Paul Whiteman. The Rhythm Kings records, Sudhalter writes, were "loose-limbed and buoyant, mixing flowing solos with tightly knit, propulsive ensembles"; "more relaxed, rhythmically looser" than the records of the ODJB and its imitators, they lacked "the insistently 'peppy' rhythm" so common at the time. In contrast to the vaudeville corniness that marked the earliest (though not so much the later) ODJB reccords, the Rhythm Kings had something of what Sudhalter calls the "stateliness" of New Orleans black bands like King Oliver's. The great black pianist and composer Jelly Roll Morton took part in one of the Rhythm Kings' recording sessions -- probably the first racially mixed record date in jazz history. THE Rhythm Kings records made a strong and lasting impression on a group of high school students in Austin, a suburb west of Chicago, who immediately -- just as in those old Judy Garland-Mickey Rooney films -- decided to form a band. The Austin High Gang and their friends defined the style of Chicago small-band jazz. Its members were also influenced by the only slightly older Beiderbecke, who in early 1924 had begun to record with a roving midwestern band called the Wolverines. In Beiderbecke's playing, Sudhalter tells us, the Gang found "something different, and somehow more immediate" than what they got from the Rhythm Kings records. "His intensity and thoughtfulness, the beauty of what he played ... made him a combination mentor and kindred spirit." Yet as Sudhalter admits, the Austin High Gang's style was "aggressively forward." 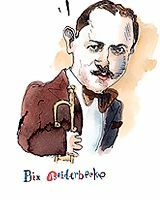 Though the musicians imitated Beiderbecke's phrases, their first records have nothing of his spirit. Nervous and edgy, the records are long on intensity but short on beauty. As the cornetist Jimmy McPartland, an original Gang member, confessed, "Bix was a mystery to us.... in a way we didn't know him at all." But of course the Austin High Gang improved, given time and experience. Dave Tough became one of the greatest jazz drummers, and the tenor saxophonist Bud Freeman won a respectable place for himself in jazz history -- though I cannot bring myself to agree with Sudhalter's extremely high estimate of him. Frank Teschemacher had become an important clarinetist by March of 1932, when he died, at age twenty-six, in a car crash, just seven months after Beiderbecke's death from alcoholism. is a professor of English at Boston College. He has just completed his doctoral dissertation in musicology at Brandeis University, on the songs of C.P.E. Bach. The Atlantic Monthly; February 1999; Black and White Intertwined; Volume 283, No. 2; pages 86 - 89.